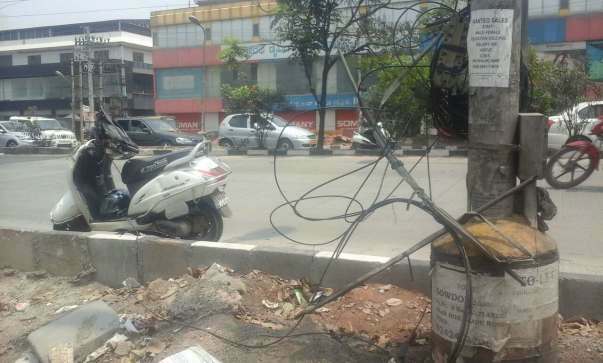 My Sister Pavithra met with an accident on April 1st near Banaswadi Big Bazzar, Bangalore due to the negligence of Civic apathy, after a public cable wire which was lying beside the road caught her bike handle and threw her forward and she hit a pole. She was admitted to the Specialist Hospital in critical condition and got treated in ICU. 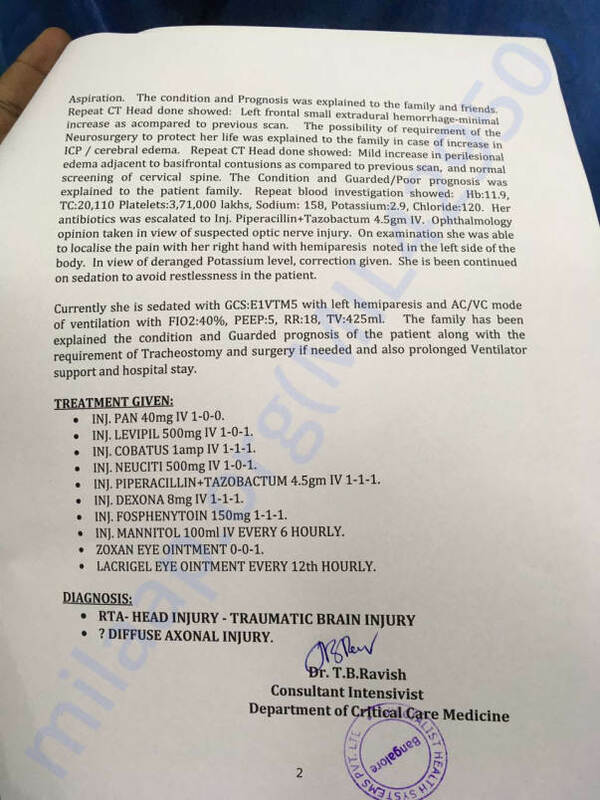 The doctor's told us that she had a serious head injury with multiple skull and face fractures and blood clotting. 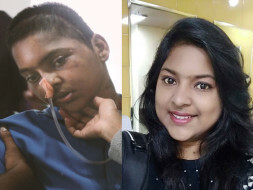 She had to undergo multiple surgeries for her brain, eye and face. Pavithra is a software engineer in Accenture. We lost our father 5 years back and my mother is a house maid, my mother struggled after my dad's death to make sure me and my sister get's a good education, My sister was the only bread winner of our family and had to take care of my family. She is the only hope of our family, we cannot survive without her, we had no savings for the future as our house expenses was more than what we were earning. 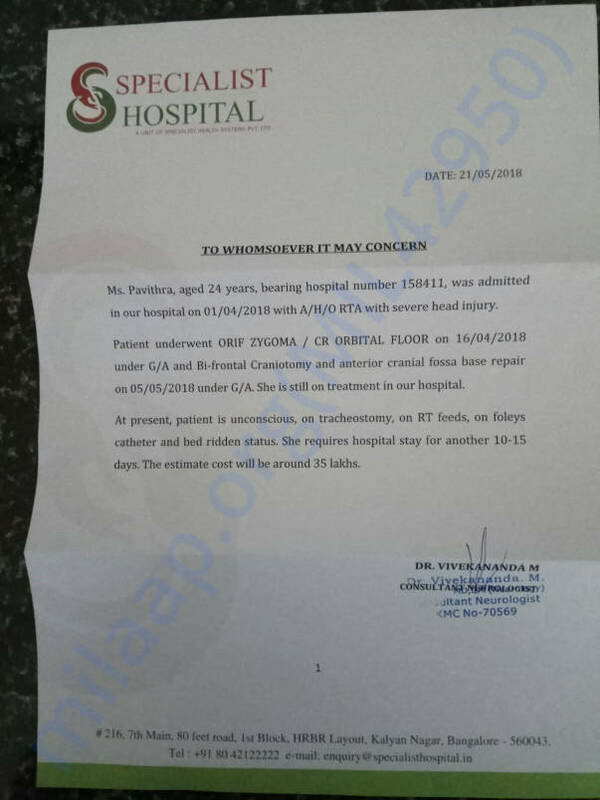 Hospital bill is exceeding rapidly and the hospital has given an estimation of approximately 35 Lakhs for her entire treatment which also includes 6 months on intense Rehabilitation. We do not want to give up on her life at the cost of money. We all request you to pray and support for Pavithra and my family. I am Sathya Shree [sister] and you can contact me on 7411808305 for more details and queries. I am attaching all the Hospital Documents and Certificates for your Reference. Thank you for the wonderful love and support that you have shown towards Pavithra. She is at home and under medication for her neurons to get activated which are inactive. We have to taken her for the same treatment but we are in need of more funds. Pavithra is not able to walk or talk properly like us. She has to undergo physiotherapy session as well but she is not responding properly for the same. I once again thank you all for your immense support. Please pray for her health and speedy recovery. We are thankful for all the love and support shown towards Pavithra! She is still on medication and undergoing physiotherapy. She needs an eye surgery which has been put on hold at present due to a lack of funds. She has shown improvement, she is able to walk by herself. Although she is able to talk she is mostly not interested in talking to anyone. 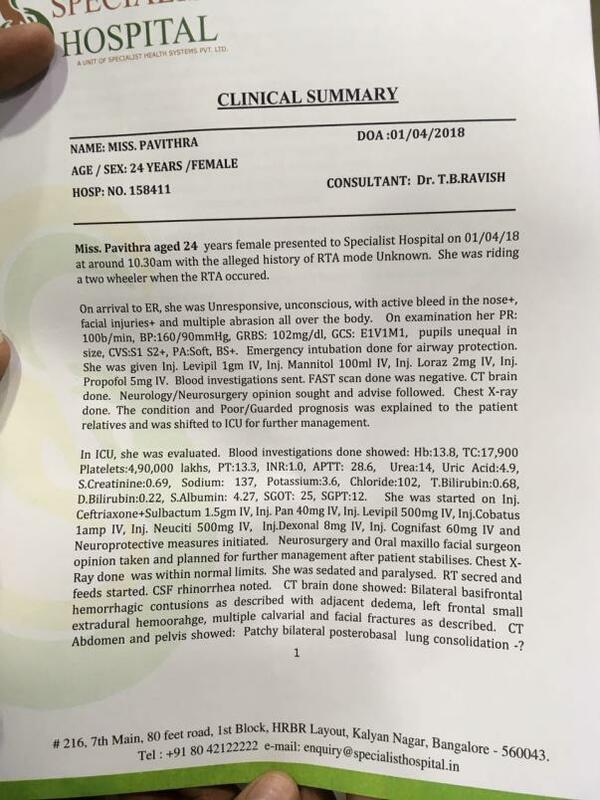 The damage to her pituitary gland will take time to heal. We are praying for her to make a complete recovery! Please continue to support her by sharing her campaign with your friends and family. 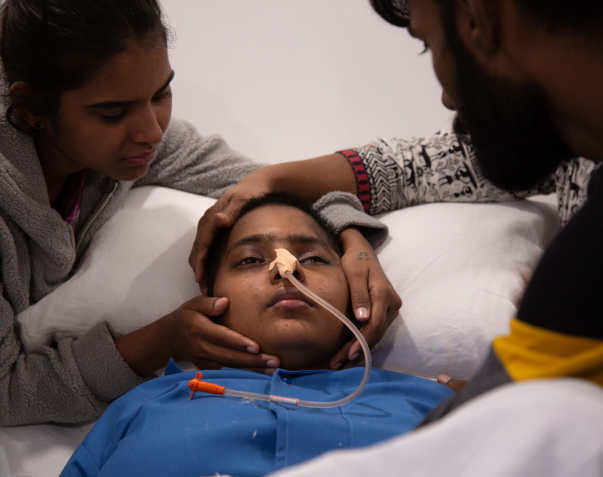 Pavithra is undergoing physiotherapy and cognitive training currently, She now able to make movements and walk with support. There is an eye surgery scheduled for her which may happen in the coming months depending on her condition. So far, she is recovering well and we're hopeful that she will be able to walk on her own soon. We're really thankful for the love and support which you have shown towards her, we shall keep you all posted.